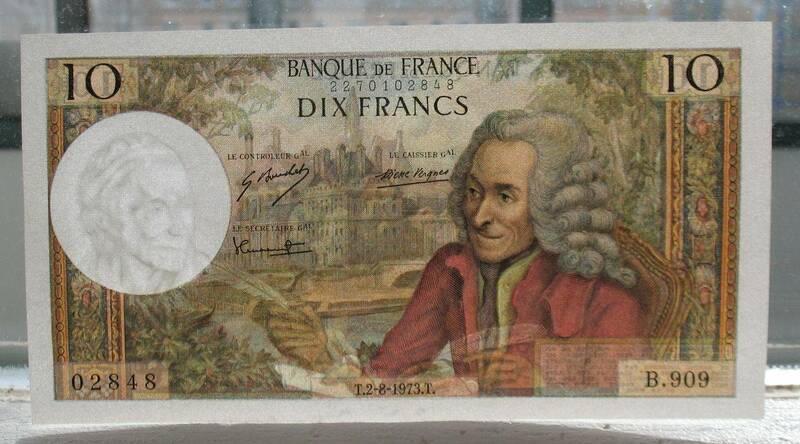 Voltaire (please, read obverse description). 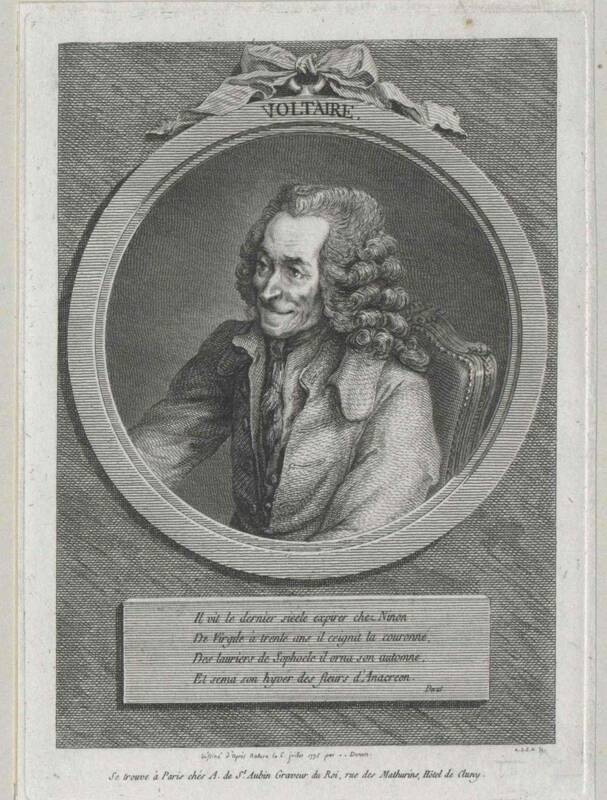 Portrait of Voltaire, engraved by Dominique Vivant, baron de Denon. François-Marie Arouet (21 November 1694 – 30 May 1778), known by his nom de plume Voltaire, was a French Enlightenment writer, historian and philosopher famous for his wit, his criticism of Christianity, especially the Roman Catholic Church, and his advocacy of freedom of religion, freedom of speech, and separation of church and state. 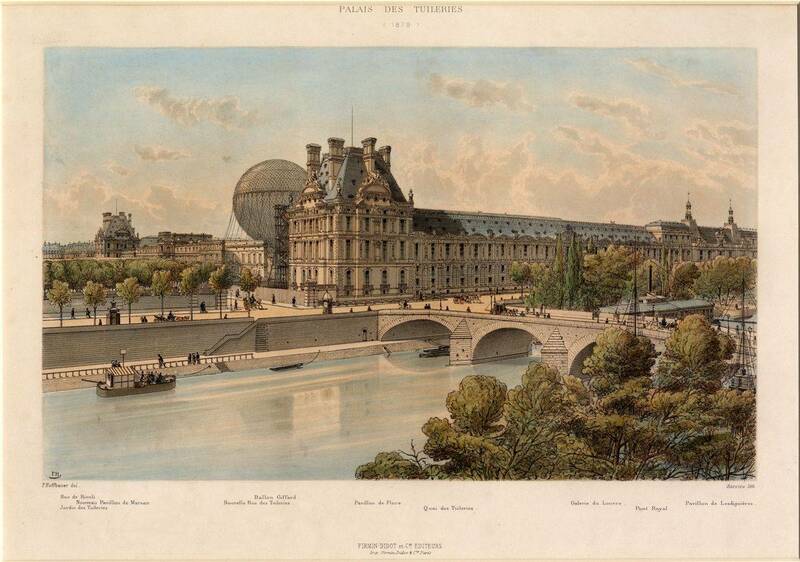 On background is Palais des Tuileries in Paris, engraved after the painting by Francis Raguenet, as Voltaire could see from his apartment, where he died. Denominations in numerals are in top corners, in words - at the top. 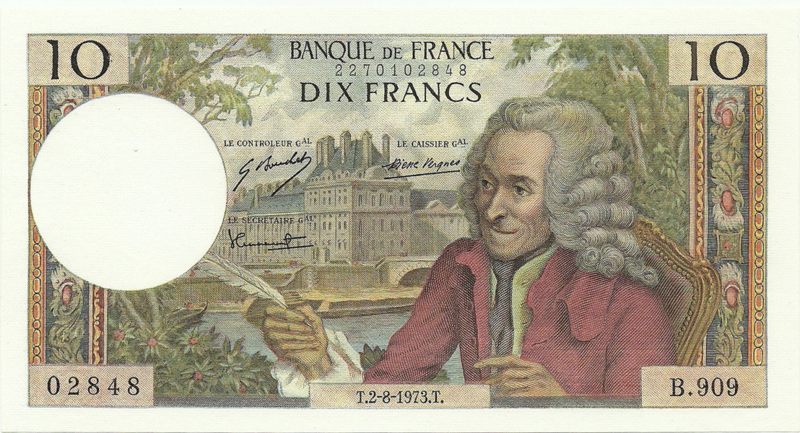 The same portrait of Voltaire, wearing a wig and writing with a quill pen. On background is Château de Cirey at the commune Cirey-sur-Blaise in Haute-Marne (Champagne) near the border with independent duchy of Lorraine - area of the Marquise du Châtelet, where the Voltaire lived from 1733 to 1740. "These forests still decorate Cirey with their wildness. The castle has retained its ancient appearance; one can distinguish new extensions and balconies. They belong to Voltaire time. On the steep roof (àla mansarde) I noticed some decorations and tall oblong pipes lined with molded images similar to the pipes of the Pont sur Seine castle, which belonged to Letitia, the mother of Napoleon. We entered Syria and were surprised by the vast halls, decorated in the latest taste. The castle belongs to Madame de Semian, a very intelligent woman who was once beautiful. He was plundered into the revolution, and after that time the whole building was resumed. Unfortunately ... we have found few traces of the former owner and her glorious friend, who, as Lebrune says, “tired out the stalled Glory”. In the dining room a few paintings depicting animals and hunting. This painting, rather pleasant, already existed under the Marquis, and we looked at it with great pleasure. Having passed several chambers, in the right wing of the castle, we opened the door to the Voltaires Hall. Despite its statehood and beauty, the Chateau de Sirey is an unfinished building, since its creator did not have time to build four more pavilions, as planned. 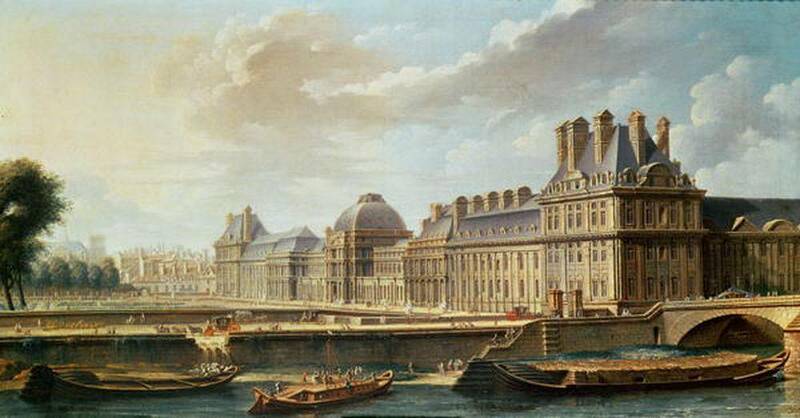 However, it was not in vain that he built it, since under Louis XIII the Marquis of Louis - Charles du Chatelet, involved in an endless network of intrigues by the king's brother, Gaston de Orleans, almost lost his life in it. Sentenced to quarrel for insulting His Majesty, he was able to escape, thus avoiding such a fateful fate, but could not save his castle from ruin. In 1642, being restored, but partly again, due to inept but ambitious projects, it is still one of the most wonderful buildings erected in the Valley de la Blaise, the building in which Voltaire was destined to be held from 1733 to 1749 the most beautiful days of their lives, thanks to their nymph and beloved Emilia Le Tonelle de Bretta, Marquis du Chatelet. This story began in 1733 in the salon of Mrs. Du Defane, in Paris, probably in one of the most intelligent salons. His mistress was very rich and adored magnificent celebrations. Since her husband drove her for too frivolous behavior, Marquis Defan, being the Regent's mistress and some other significant and prominent people, cannot continue her luxurious life. However, she is so clever, charming and well-educated that her friends prefer to sit on the floor in her salon than to occupy gilded chairs in any other. The most important and picturesque decoration of this salon, undoubtedly, was Voltaire with his long nose, bright eyes, devilish mind and huge wigs. All the ladies, from beauties to ugly, molted, reading his works, repeating his words. And when he entered a house (the salon of Madame du Defant was not the only one where his presence was honored), everyone froze in anticipation of something extraordinary. Silence was broken only by moans, since the most sensitive persons took the habit of fainting at the sight of this great man. In this way, reverence was shown to all exceptional persons. Madame du Defant knew well what such visits threatened, and therefore always carefully prepared for his arrival, and especially when some beauty was going to see the genius for the first time: she placed many soft cushions and chairs in the corners ready to accept too impressionable creation ... And she does not forget about this ritual on the day when she expects both Voltaire and the young Marquis du Châtelet, who begged her to give her the opportunity to see the man of her dreams. Voltaire comes first, cares for the hostess, gets comfortable and starts telling. When the Marquis is announced, everyone is breathtaking, and the most merciful people move to the door in readiness to pick up the victim of a strong experience. But they do it in vain, for Madame du Chatelet is not one of those women who faint easily, even if the Lord God is here! - How long have I dreamed of telling you this! - she sighs. - You can not imagine how I love you! ..
You can be an ascetic philosopher, you can be a complete cynic, but you can, as it turned out, be completely unarmed and stupid in the face of a pretty woman in love: this is what happens to the future father Candida. He is about forty, but he is blinded by a young woman who took him by storm, and immediately falls in love with her. But was it really this lady Madame du Chatelet? We can doubt this by reading the portrait that Madame du Defant sketched from her: “Imagine a tall, thin woman, without hips, with flat breasts, large arms and legs, with huge feet, a very small head, a sharp little face, With a sharp little nose, two small turquoise eyes, a dark, reddish face, with thin lips and rotten teeth ... "Indulgence was never on the list of the virtues of Mrs. du Déphant, and a substantial drop of jealousy of this love that was born before her eyes brought her to st ol evil judgment. In general, everyone noted the brilliance and charm of the "beautiful Emilia ..."
“Whatever it was, but, having left Madame du Chatelet's house, Madame du Chatelet immediately entered Voltaire's house of love, becoming his mistress, and no longer wasted time, moving from theory to practice. And soon the whole of Paris and only talked about this great passion. A passion in which two exceptional natures met, for if Voltaire was a great man, then Emilia was, at least, clearly not like all women. She was just crammed with different sciences, at the same time she had a linguistic gift, speaking Latin, like Cicero. She analyzed Leibniz and studied Newton's differential calculus. She was well versed in geometry and physics, was on "you" with astronomy and the natural sciences. With such a temperament, she could not help but draw attention to herself, which naturally took place (she already captivated more than one person with good taste). However, her husband was not offended at all. The lieutenant-general of the royal army, who came from a large Loren family, Mr. du Chatelet, like all military men, was rarely at home. On the other hand, he was a very well-bred person who considered it unworthy and ridiculous to show his jealousy. His wife gave him two children, a boy and a girl, and he believed that in this way she had already fulfilled her marital duty. He does not even find anything reprehensible in the fact that Emilia breaks up with him in order to live “his life” near Voltaire. - Well, of course, no! - said Mr. du Chatelet, kisses the handle of his wife. Then he put her in a carriage and wished her a good trip. The very first fire of their passions was forced by lovers, hiding, to kindle in the Chateau de Monge, near Otan. However, in Paris, the situation became critical. Bookseller орor published "Philosophical Letters", which caused a terrible scandal. Cardinal de Fleury sent a trail of police. We had to get away. And then Mr. du Chatelet shows his broad nature: he gives this couple - because, of course, Emilia refuses to part with his genius - refuge in his castle Sirey-sur-Blaise, which is very well located away from any temptation. There was no fear of inappropriate visits. In truth, this hermitage was delightful only at first sight: the building was in terrible condition, the roofs were leaking on rainy days, and the gardens grew so thick that they went straight into the forest, reminding horrible bushes from the Sleeping Beauty tale. But Voltaire was not afraid of difficulties and announced that he would settle everything. Despite the order of the cardinal, and, perhaps, thanks to him, his copyrights rise in price quite high, which allows him to advance forty thousand livres for restoration work. And very soon the hermits find themselves in a comfortable house, a house to which friends gradually begin to flock to contemplate this rather instructive well-being. That's what height it brings! Assuming that there must be some gaps in the education of his girlfriend, Voltaire teaches her English and Italian, and so successfully that they sit down to translate Shakespeare and Le Tass. In short, this couple is so busy that for love they hardly have a few minutes. Little by little, Voltaire is discharged from accusations of unreliability. He is doing well with Versailles. For a while, he even becomes a protege of Madame de Pompadour. He still does not part with Madame du Chatelet, but one day a genius realizes that he is in love with his niece, Madame Denis. For Emilia, this becomes a real tragedy: tears, screams, threats! It was necessary for someone to take the responsibility to calm her down, and this someone would be none other than ... Mr. du Chatelet. In 1748, Voltaire and Emilia left Sirey for the last time to arrive at the castle of King Stanislav, who invited them. These fun, carefree days spent at the king end tragically: September 8, 1749, Emilia dies. Inconsolable, Voltaire follows his friend King Frederick II of Prussia. He will never return to Cirey. 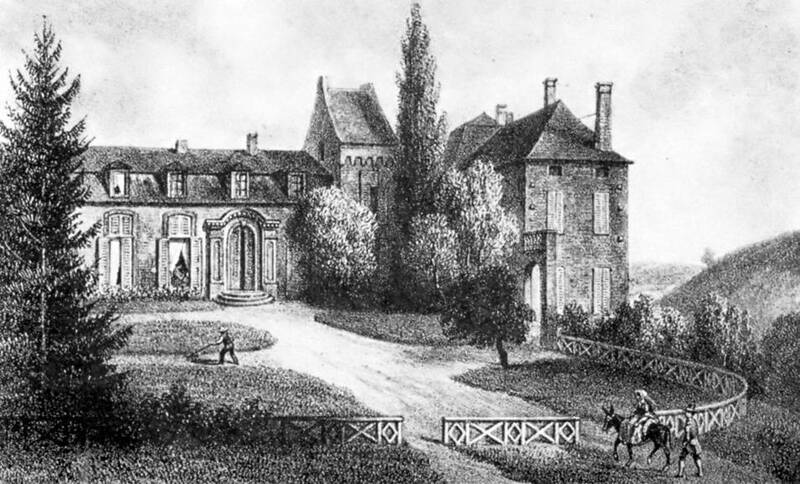 Just before the start of the Revolution, the son of Madame du Chatelet will bequeath the castle to his niece, the beautiful Madame de Simgan, who will take Lafayette here, to whom she has some weakness. Currently, the castle belongs to the comte de Salignac-Fenelon. Bruce died at the age of forty-three. Many authors who have studied her short life believe that Emily was a truly unique woman and scientist. She lived in full force as a truly spiritually rich person. She managed to maintain her faith and position in the high society of Paris, while continuing to maintain her love of mathematics. 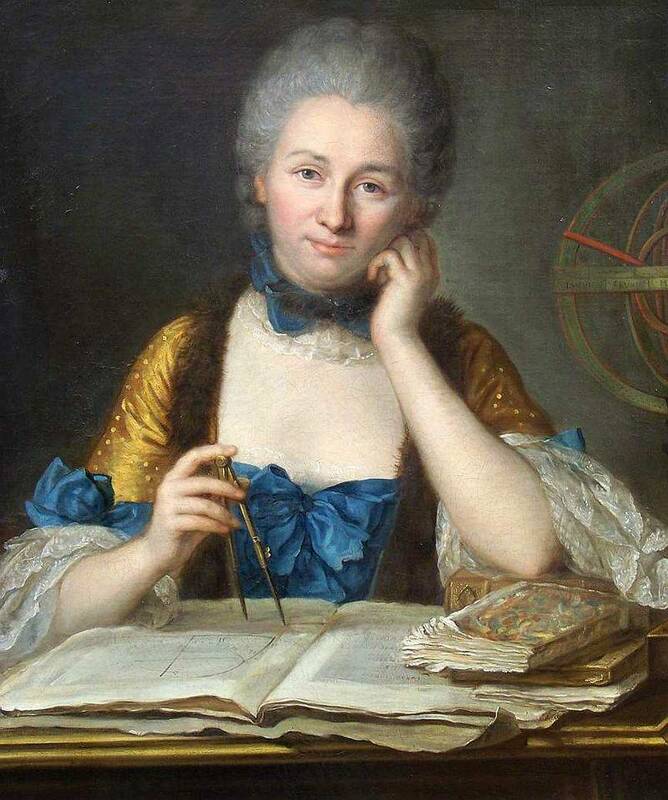 Emily de Chatelet was one of those women whose contribution contributed to the formation of the course of mathematics. And although she did not create her own original teaching, her translation work, comments, and generalizations made a significant contribution to the development of science. Voltaire wrote that "She was a great man, whose only fault was that she was a woman." “Here for a long time Voltaire was happy in the arms of Muses and custodial friendship. Where I live, earthly paradise, - he wrote to his friend Terio. - No wonder! Imagine a better society, the most learned people in France, court witty Poets, such as Saint-Lambert, for example, who knew how to combine courtesy with deep knowledge, philosophy with publicity, and among such people - the Marquis, who knew how to animate everything with her presence, everything has been given an inexplicable charm - and you will have an idea about the earthly paradise of Voltaire. “She is a miracle in France,” Voltaire said. * The mind is extraordinary, the face is beautiful, the soul of the angel, the frankness of the child, and deep scholarship - everything was charming in this sorceress! 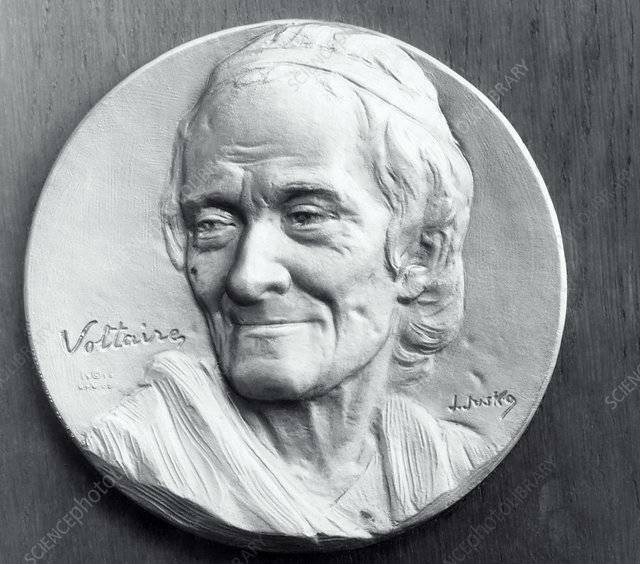 She, contrary to Ms. Zhanlis, contrary to journalist Geoffroy and all the enemies of philosophy, was worthy of Saint-Lambert’s ardent love, Voltaire’s friendship, and the glory of her age. Here the Marquis ended her life in the bosom of friendship. All residents cried about her as a gentle, protective mother. The poor have a memory in their hearts: they still blessed its ashes, when our Writers began to resent his calm with slander and shameful curses. But Voltaire was inconsolable. You remember his letter, in which he from Bar-sur-Oba notifies of the illness and then of the death of the marquise. Our courteous guide would continue his speech if it had not been called for dinner. The dining room was decorated with Russian flags ... But we comforted the shy shadows of the Syrian Nymph and her friend by reading a few verses from Alzira. Thus, we reconciled with the Penatas of the castle, and with a certain pride, excusable warriors, in those chambers where Voltaire wrote his best poems, we read with admiration the odes of the Singer Felitsa and the immortal Lomonosov, in which the inspired Lyrics praise the wonderful greatness of Russia, love for the fatherland Her sons and the glory of the Russian sword. Dinner lasted a long time. The evening found us, like the heroes of ancient Omer, with a cup in their hands and in sweet conversations based on the frankness of the heart, known to more kind-hearted warriors than you, the inhabitants of the capital and the brilliant big light. But we still took advantage of the twilight: we went around the lower dwellings of the castle where Mrs. de Semian lives; examined her library - a wonderful and rigorous selection of the best Writers, who make up this favorite woman’s favorite reading, a worthy niece of Mrs. du Châtelet: courtesy, intelligence and beauty are hereditary in this family. Cold increased with the onset of night. In the Voltaire Gallery, we made a big fire that could not warm us up completely. All Voltaire works were on the table in front of us, and we read with great pleasure some of his correspondence in which he speaks about Mrs. du Chatelet. In the noise of the military is pleasant to relax thoughts on the subject, so worthy of love. Deep night found us talking about the past century, about the great Catherine, his best decoration, about the quarrel of the King of Prussia with his chamberlain, etc., at the very fireplace, at the very place where Voltaire composed his messages to glorious contemporaries and those immortal poems for which the justly irritated offspring will solely forgive his memory. G. Pisarev was in awe. Finally, it was necessary to part and think about the bed. I took a room in the upper housing, very deceased, but where it was hardly possible to make a fire. The old housekeeper announced to me that Mr. Montesquiou, a relative of the landlady, a very intelligent and supportive person usually lives in this peace, and that he, the key house, is happy that I got his bedroom. “Vous avez l’air d’un bon enfant, mon officier”, * he continued, friendly hit me on the shoulder. Fine, but from his courtesy the room did not seem warmer to me. All night I laid out the fire, cursed the French fireplaces, and only at dawn I fell asleep with an iron sleep, having forgotten both Voltaire, and the Marquis, and the war, and all of France. When I woke up quite late, I went up to the window and grieved at the neighborhood covered with snow. the jolly hills, decorated with gardens, vineyard and country huts, everything frowned, everything was despondent. The wind rustles in the cedar grove, in the dark alley of Zairina and curls dry leaves around flower beds, trampled by horses and disfigured by snow and mud. In the castle, on the contrary, silence is deep. Two oak roots burn in the fireplace and invite me to the fire. On the table are letters Voltaire, written from this castle. Everything in them reminds of past times, of people who all disappeared from the face of the earth with their passions, with prejudices, with hopes and with sorrows, inseparable companions of poor humanity. Why so much noise, so much anxiety? Why this thirst for fame and honor? - I ask myself and am afraid to find the answer in my own heart. The letters about Cirey Castle have been preserved by a miracle, like the memory of Great People, about that time and grateful memoirs that have kept these letters. 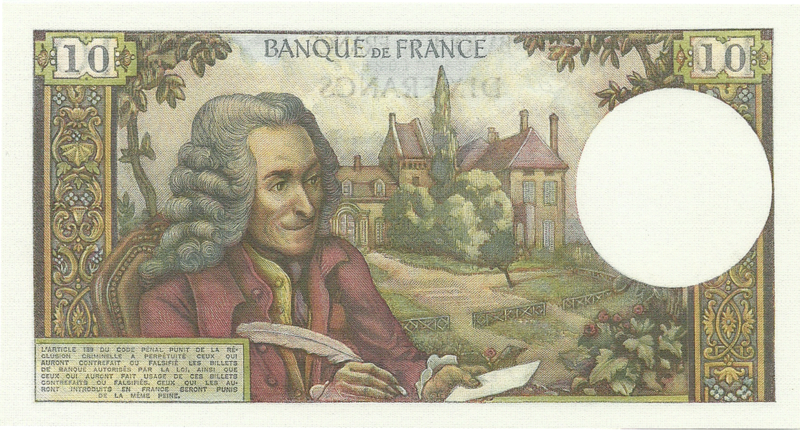 Ruth Hagengruber, Émilie du Châtelet between Leibniz and Newton, Springer Science & Business Media, 2011, 256 p.
In lower left corner is an inscription: "L'Article 139 du Code Pénal Punit de la Réclusion Criminelle a Perpetuité Ceux qui Auront Contrefait ou Falsifié les Billets de Banque Autorisés par la Loi. 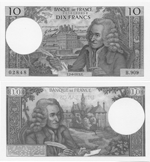 Ainsi que Ceux qui Auront Fait Usage de Ces Billets Contrefaits ou Falsifiés. Ceux qui les Auront Introduits en France Seront Punis de la Même Peine." In English: "Article 139 of the Penal Code punishes criminal imprisonment for those who have counterfeited or falsified bank notes authorized by the law. As well as those who will have made use of these counterfeit or forged tickets. Those who introduced them in France will be punished by the same penalty." Denominations in numerals are in top corners.